Goodbye, House. Hello, Home! 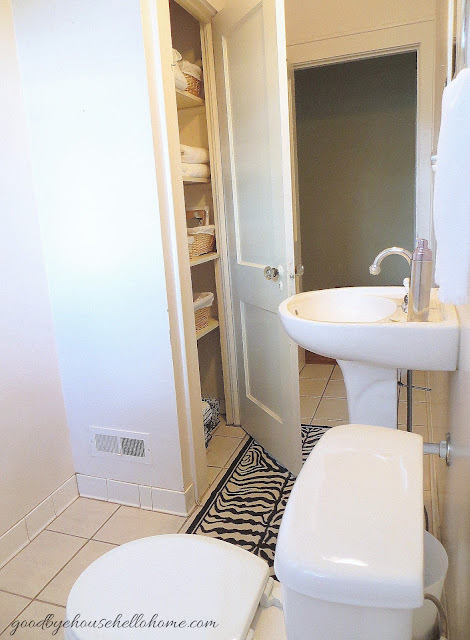 Blog : Do You Think This Bathroom is Missing Something? Do you notice something that is missing? which thrills my college daughters immensely. and I talk about her in this post: Goodbye, Hobby Lobby. Hello, Estate Sales! This tiny room also has sparkly old glass doorknobs. 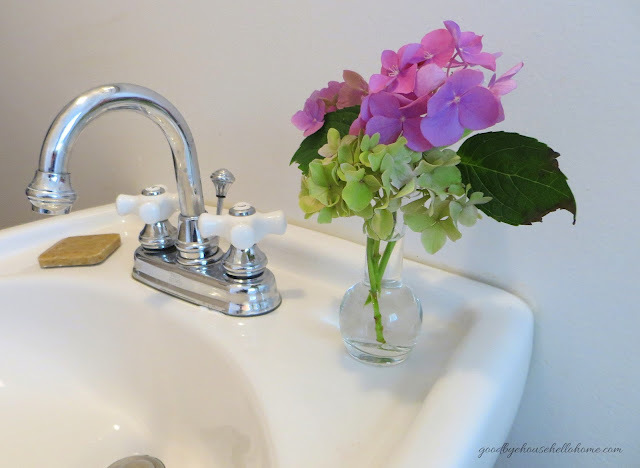 There is a sink available and happy hydrangeas for color. 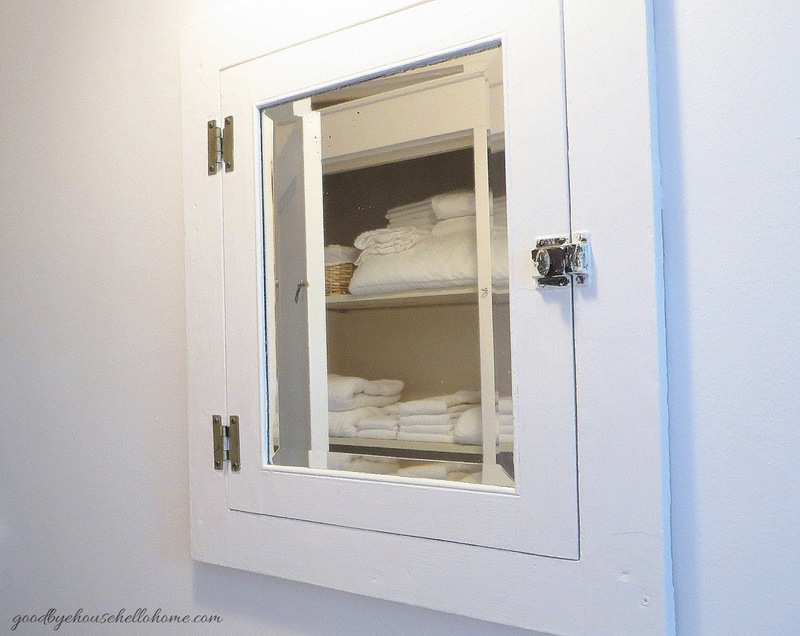 The closet immediately got organized and is now available for use. 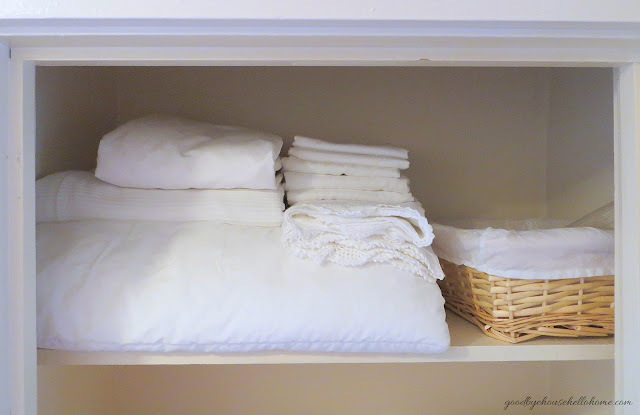 an extra comforter, coverlet, and pillowcases. face masks, soap galore, air freshener, face wash? 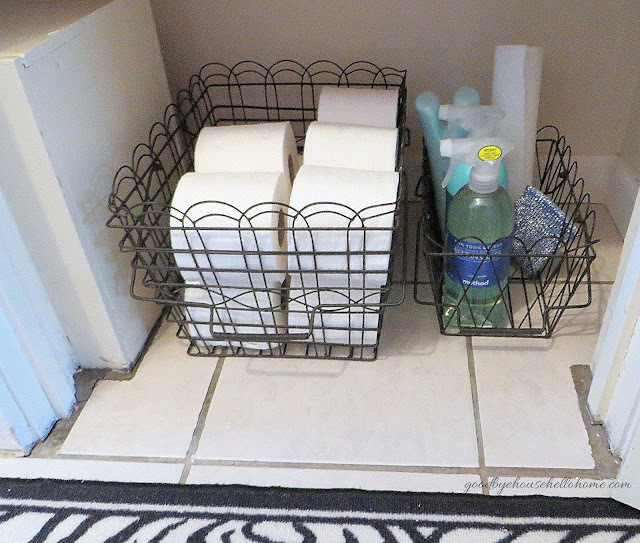 Extra toilet paper and cleaning supplies? My daughters are quite set for any hygienic emergency. They can even see themselves to put their makeup on or brush their teeth. But for now, they are roughing it on this end of the powder room. Don't worry, girls, we have plans to add this. I LOVE IT!! EVERY LAST BIT OF IT....EVEN WITHOUT THE SHOWER HEAD BECAUSE YOU HAVE A SOLUTION!!! GAH! Glass doorknobs and skeleton keys ... I am swooning!!! I was going to suggest the very thing you showed at the end of your post ... we had to do that on a tub at our other house - works great. The closet is amazing - love the glass jars and baskets. I do feel so blessed! Looking lovely, my lovely. A beautiful job once again by Leslie the Homemaker. I love when you stop by! I miss you! It's so beautiful! 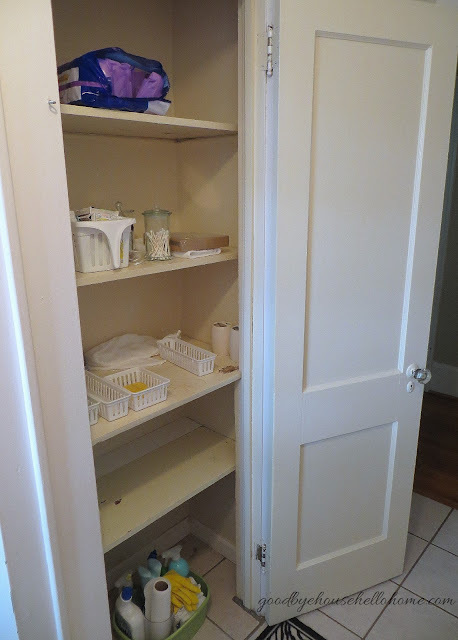 Great job on the closet, too! Love it! It's such a cute bathroom but super weird there's not shower head... :/ I love that big closet in there though, where did you get the baskets on the bottom with the TP in them? 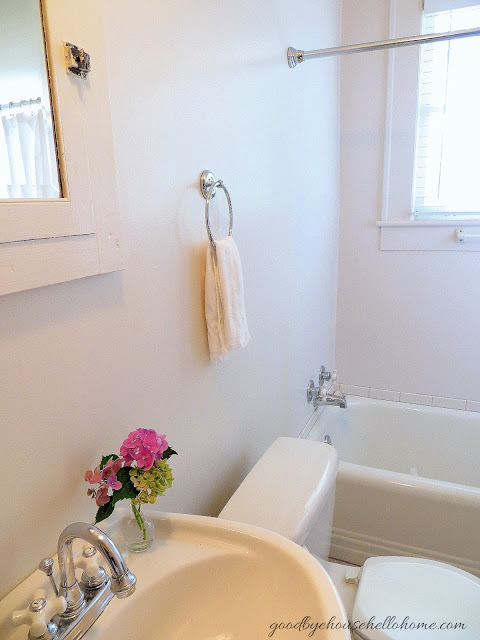 I love this vintagey old bathroom! I'd love to soak in that tub... who needs a shower? But I know...a shower is nice, I like the solution you have about to happen! The closet is wonderful. 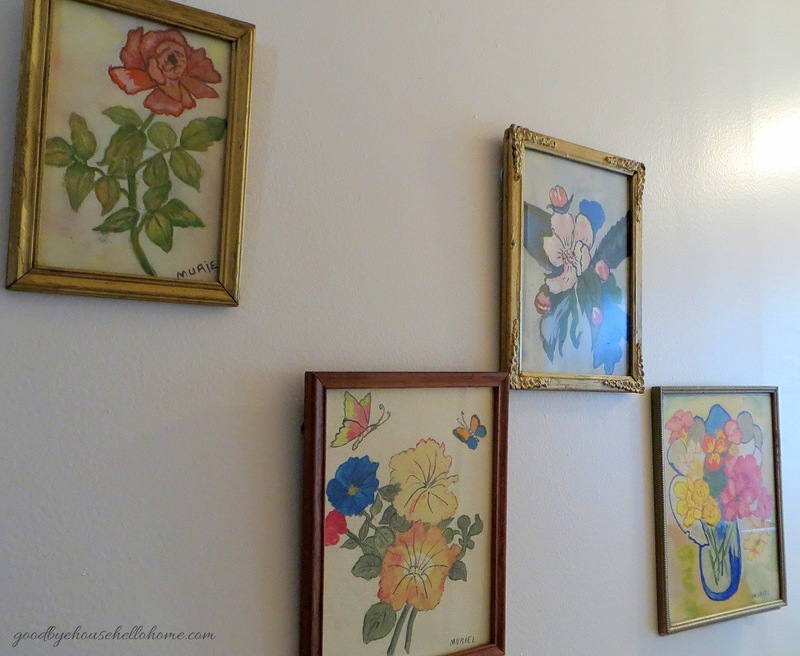 It reminds me of my Grandmothers bathroom only they had tile (50's pink) going half way up! and I'm so glad you have the key. You should tie a string on it and NAIL IT TO THE BACK OF THE DOOR! 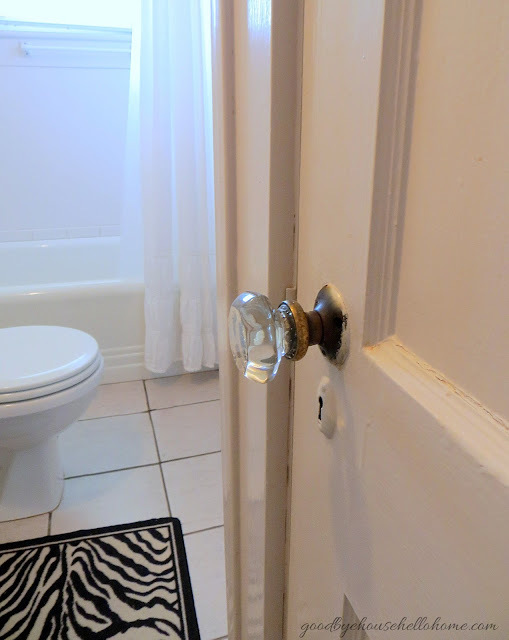 I got locked in a bathroom with a key hole...and a turn latch...I was 12...I don't know how I did it...but I was visiting a Great Aunt and Uncle in Chicago-- it was embarrassing!!! Wow!! What a charming home you are getting to make your own. Looks lovely!! 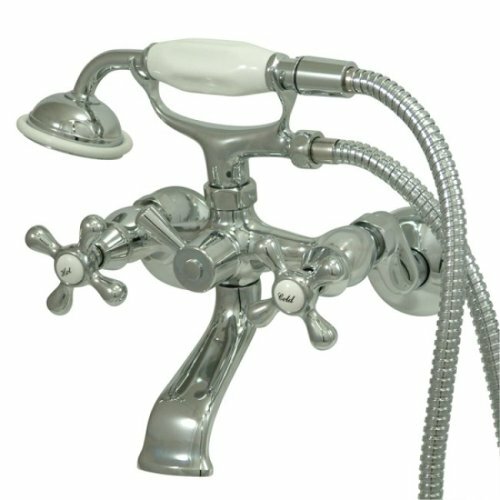 I did the same thing for a shower head in an old house I rented when I first lived on my own. It worked great for me! And I love how you organized the closet. 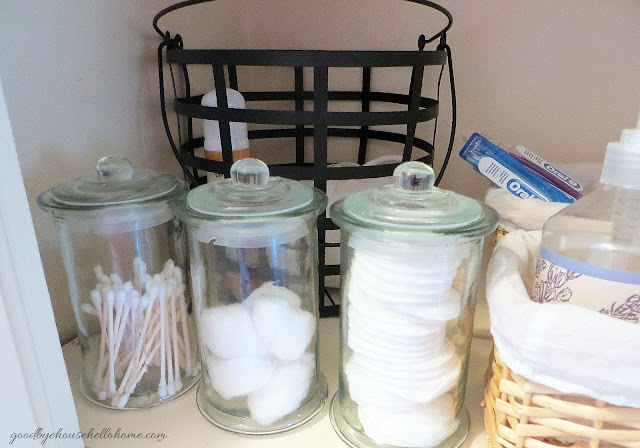 Those baskets are beautiful! My old house didn't have a shower head in the hall bath either. My girls were little then, so it didn't really matter. But if we didn't have that now.....oh boy! Can't wait to see more of the house. We have a very old home. We bought it 2 summers ago before we got married. It was definitely a fixer-upper but we got a great deal. The #1 issue was no shower. Thankfully my father is a plumber so he installed one! We had 7 weeks from the time we bought it until the wedding and then after our honeymoon we moved in immediately. I love that it's old because, as my dad says, it has "character." Arched doorways, "built-ins" in every room, curved ceilings... we did update it a lot with new counter top in the kitchen, new paint in every room and a new bathroom, but it still has that old house charm. 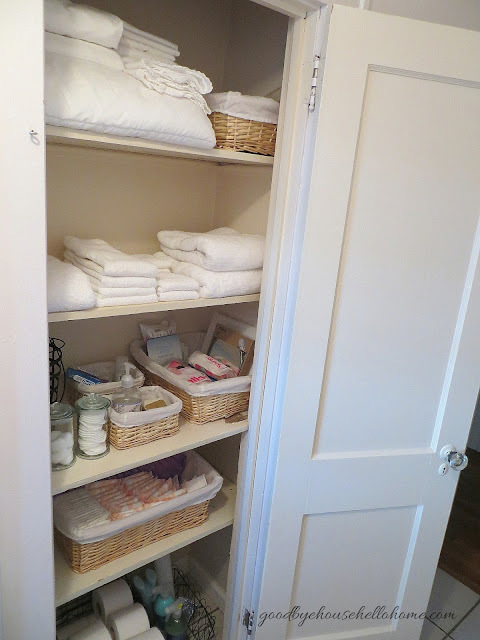 I think there is a little bit enhancement required in the storage as the the way cabinet have been introduced to the bathroom they don't suit with the Storage theme. Love all that you've done and can only imagine all the fun still ahead. Glad you're sharing. Looking good, Leslie! 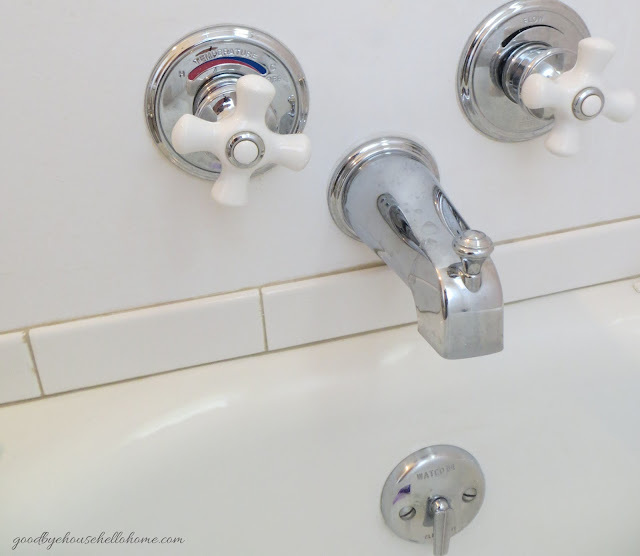 We added the hand-held shower to the original claw foot tub in our old house, and it's a great solution! You've done a super job pulling things together so far. I love your little breakfast nook, too, although I totally understand why you'd like to move the corner cabinets and add a bench. That will look great! For now, I hope you're enjoying getting your new nest in order. I'm so thankful you found it! The shower handle is going to be a great addition. I'm wondering if you will have to protect the window somehow, maybe make sure the caulking doesn't have gaps to prevent future water/mold issues? Hard to tell from the photos, just thinking. 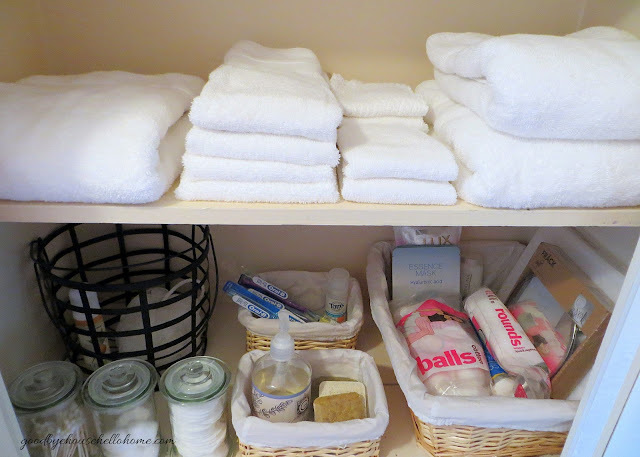 You have a real talent organizing your closets/storage. 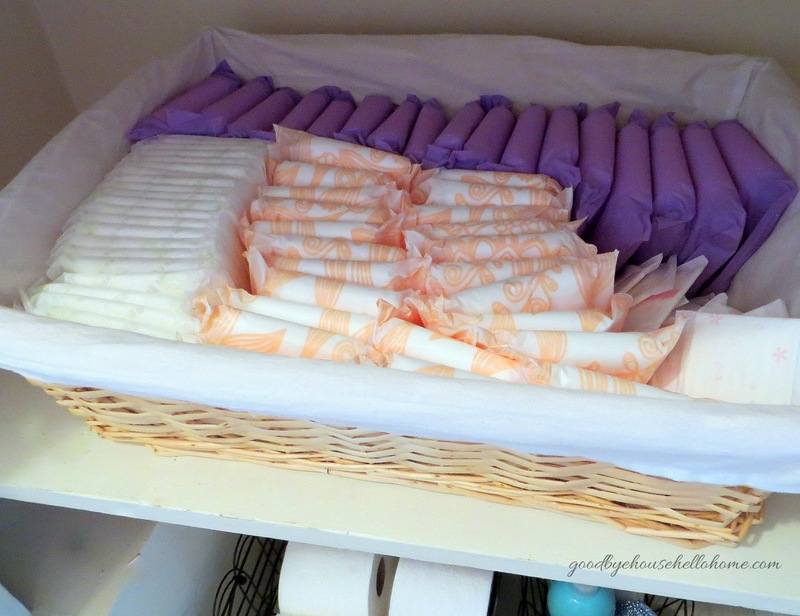 I remember you saying that buying white makes things so much easier and this really shows how it looks prettier too. Have a great week, my friend. My husband and I moved into an old house recently which has a window in the shower on the first floor. However, the previous owner left us all the window dressings. 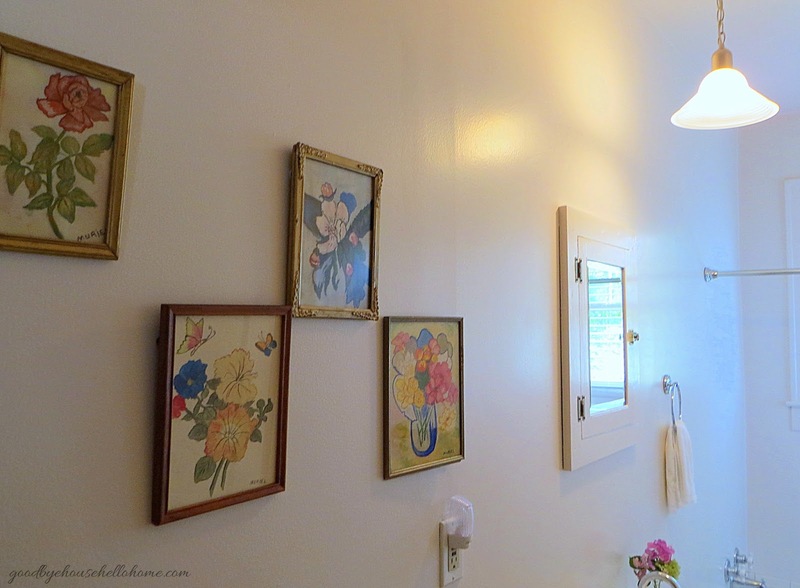 Including the shower curtain that she had used as a regular curtain over that window.